Hot water is something we tend to take for granted and expect to be available when we need it. If you have a combi-boiler, you’ll be used to having on demand hot water day and night, whilst those using a conventional or system boiler will know when to expect a supply of warm water to be available for bathing, showering or washing up. If you are expecting warm water from your taps only to suddenly discover that there is no hot water, it can be both unpleasant and inconvenient. This guide will help you to identify and solve common causes for hot water problems. The first thing you should check if you have no hot water is whether or not your boiler is working. Depending on the type of boiler you have, the first sign that your boiler is not working will often be a change from the usual display colour along with an error code. 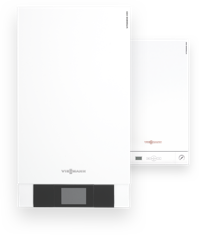 To find out what the error code means, consult your boiler manual or have a look on our Fault code page for Viessmann boilers. Some fault codes can be easily rectified yourself with a simple boiler reset, whilst others may need professional attention. If you are not sure how to fix the fault code, it is recommended to contact a qualified engineer for advice. If there is no display on your boiler, this may indicate that the problem is with your power supply - checking to see if you have electricity to your lights and sockets will quickly confirm this. You may also want to check your main fuse box. If you have experienced a recent power cut, this may have also affected your boiler settings. Also make sure there is a water supply - if no water comes from the taps, there may be a temporary supply interruption. Whilst this may seem obvious, it is easy to overlook in the heat of the moment. Finally, make sure you have a gas supply by checking other appliances such as your gas cooker. Water and heating - not heating only. There is always a possibility that the settings may have been adjusted without your knowledge or by mistake. Also check that the hot water is set to a reasonable temperature. Another factor to consider before calling an engineer or plumber is to check your timer. This may have been affected by the clocks changing, power supply, back-up batteries failing or even somebody altering the settings without you knowing. It should be easy to see at the timer control panel if the boiler is currently active for hot water. If you are not sure, check your timer manual. If you are confident that your hot water problem is not caused by one of the above problems then it may be advisable to seek help from a trained Gas Safe engineer. You may wish to look at the following options if you feel confident to do so. If you have followed the previous steps and still the hot water does not work but your central heating is fine, then it is worth checking the diverter valve. This is a special part of the system which allows your combi-boiler to switch between hot water and heating. If the diverter valve is not working properly, it could be stuck in the central heating position or may have developed a fault. One sign of this is if you need to turn the central heating to maximum in order to get any hot water. A problem with the diverter valve will require the help of a professional Gas Safe engineer to fix. If your home runs on a combi-boiler, then low pressure may be the reason for your lack of hot water. The water pressure for a standard domestic boiler is usually around 1.5 bar and will be displayed on a gauge known as a ‘Manometer’, usually located where the water supply pipes are connected to the boiler. If your pressure is below the normal operating range, follow this guide to re-pressurise. Important: Be sure to consult the operating manual first to ensure that you are able to re-pressurise the boiler yourself. If there are no instructions for this or if you have any doubts, be sure to seek the advice of a qualified engineer. Find the location of your filling-loop and pressure gauge. You should find that the filling loop handles are at a 90° angle to the flow of the pipe. Before beginning, make sure you can see the pressure gauge at all times whilst accessing the filling loop. The operating pressure for most systems is around 1.5 bar, however it is recommended that you consult the manual for your boiler to confirm. The correct pressure level will often be indicated on the gauge for modern systems with a green area. Slowly turn both of the filling loop handles until they match the direction of the pipe - as you do this, you should be able to hear water flowing. Take care to observe the gauge at all times to avoid over-pressurising the boiler. It may be easier to get somebody you trust to help you. Once you have restored the correct pressure, ensure the handles are fully closed. If you continue to experience problems with your boiler losing pressure, find out more about possible causes and solutions in our advice concerning the topic boiler loses pressure. A leak in either your heating or hot water system can cause a fall in pressure and result in a lack of hot water. Leaks can also cause other problems associated with damp which may lead to significant damage. Look for patches on ceilings, peeling or flaking paint on or around pipes, swollen woodwork and mould patches. Leaks often occur at joints in pipework which are usually visible, so these are a good place to start. Take care not to mistake condensation for a leak. If you have a conventional system and have a problem with your hot water heater not working, then you may need to make sure that there is water in your header tank. If the tank has run dry, this could be due to a problem with the ballcock seizing and preventing it from refilling. Is your boiler big enough? If you have eliminated any fault in the system and you have a recurring problem with your hot water supply, the problem may be that the boiler simply isn’t big enough and is struggling to provide enough heat and hot water for your house. In the long term, it may be cost effective to upgrade to a larger boiler if this is the case. An expert will be able to advise you of the optimum boiler size for your home based on your current and future needs. Is your boiler due a service? The best way to avoid a nasty surprise with your hot water supply is to ensure your heating and hot water system is regularly maintained by a qualified professional to help keep everything running safely and smoothly all year round. Want more hints and tips? Subscribe below to get the latest heating advice and energy saving tips straight to your inbox!